Nationalist youths hijack a car in Ardoyne in north Belfast, after officers cordoned off the area to allow through a loyalist parade. RIOTING BROKE OUT in parts of Belfast, Derry and Strabane last night in a second consecutive night of violence in the North. In the Ardoyne area of North Belfast trouble erupted in advance of an Orange Order parade with petrol bombs, stones, fireworks and debris hurled at members of the PSNI, reports the BBC. Police fired plastic bullets and water canons to force nationalists away from the area. Youths lashed out at police both before at after the marches. The Ardoyne rioters tried to force their way on to the major local road in protest at the parade. Police had permitted it to pass under strict conditions — including a requirement that the Orange Order march to the beat of a lone snare drum. The police, determined to prevent street fighting, held their ground backed by three massive mobile water cannons that doused street fighters, journalists and spectators alike. Several police officers were injured and a press photographer was hit by a plastic baton round. The Irish News (print edition) reports that nationalists have questioned police tactics and the deployment of water canons, while Sinn Féin assembly member Gerry Kelly has said that an alternative protest organised by the Greater Ardoyne Residents Collective was always going to be a “recipe for disaster”. The PSNI said that calm had been restored to the area by 2am this morning, while violence was also reported in south Belfast, where parked cars were set alight and one person was injured when hit by debris in the Stewart Street area. Two juveniles and two adults were arrested. 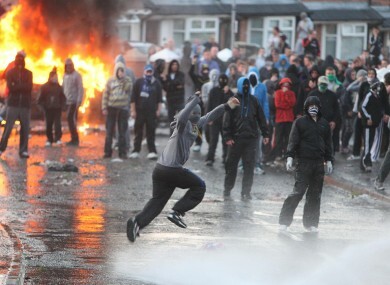 Meanwhile in Derry seven men were arrested in connection with riotous behaviour after violence in the Fahan Street area. There were also reports of disorder Strabane and Ballymena. RTÉ reports that up to 100 petrol bombs were thrown at police during the course of last night’s violence. The PSNI had earlier appeared for calm after rioting on Monday night left 22 officers injured. The PSNI has praised the work of community leaders in the efforts to restore calm across Northern Ireland last night. Email “Second night of violence across Northern Ireland as the Twelfth parades pass”. Feedback on “Second night of violence across Northern Ireland as the Twelfth parades pass”.